Gardeners tend to become obsessed with plants. They name their dogs Iris, volunteer at public gardens, buy clothing with pictures of flowers and are constantly reading plant books. Their houses have plants on the window sills, and storage for flower pots in their laundry rooms. In fact, their laundry rooms are designed to look like a potting shed. This is the beauty of gardening; plants can easily be incorporated into your home and everyday life. The combination of plants and people blend seamlessly together. There are two applications for plants and people: the residential household and glass rooms. In a residential home you will find people decorating with their plants. Dried flowers hang from the rafters in the kitchen, and small plants like African violets are grown throughout the year. Philodendrons, geraniums and coleus cuttings are raised through the cold winter months. In February the forced bulbs bloom and sit atop tables. There are ferns on the front porch in summer, as well as in front of the bay window on a plant stand. Windowsills are filled with plants and end tables house small flowers. House plants are typically grown in attractive containers. Inside the house the plants have to look healthy and match the style of the home. To accommodate your plants growing requirements you will improvise their environment and there are little tricks to keep each plant happy. An orchid needs humidity so you place it on a gravel tray filled with water. I grow my orchids in the bathroom so they receive the needed humidity and heat from the shower. Light sensitive lights such as a philodendron may fare better on a north windowsill with a sheer drape so that it does not burn in the summer months. Keeping your Christmas cactus in the garage during the fall months will provide the cool temperatures needed to set a bloom. In a glass room things are a bit different. There are greenhouses, conservatories, sunrooms, garden windows and pool enclosures where you can grow plants. Things do not need to be as formal in these spaces and it is easier to grow the plants. You can grow your plants in the plain black plastic containers from the nurseries, instead of colorful ceramic ones. While it looks bad to have sick plants in your house, in the greenhouse it is not as noticeable and you can try to bring your weak plants back to life. In the glass rooms you can grow a higher quantity of plants than the home. Dirt or blood stains on the floor of a glass room will not ruin the carpet as most have concrete or tiled floors. Inside the greenhouse, it is easier to create the ideal plant environment. Circulation fans will hang from the rafters and move the air, cutting down on pests and diseases. Grow lights help the plants produce more flowers and fruits, or become taller and bushier depending on bulb type. Tiered benches create more growing space. Indoor trellises allow you to grow vining plants year round. Foggers create the humidity that tropical plants require to thrive. The garden window is a greenhouse on a smaller scale. The unit has shelves for the plants and often includes a ridge vent for ventilation, with heating and cooling coming from the house. Casement windows are typically designed into the sides of the window. Sizes range from small in scale, growing about five plants, to as tall as a person with multiple shelves are larger growing capacity. A pool enclosure has high humidity which could be beneficial for certain tropical plants. In the glass rooms you can integrate plants and people. The greenhouse will primarily have only plants, but it is very beneficial to have a table and chairs. You can sit down and have your morning coffee while observing the plants. You can closely inspect your plants and will better notice who needs more water, which plant is sprouting a new bud and others that are in active growth. You will see that the papaya plant has grown and is almost touching the eave line, and you will see that the rick rack cactus has lost its dark green hue. 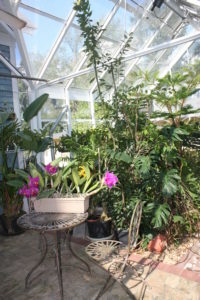 The sunroom and conservatory are used primarily for people, but the gardener will add plants. The conservatory is a more decorative structure compared to the sunroom. It features grids in the windows, ridge cresting and a finial on the roofline. On the interior of the conservatory you will find decorative caps on the rafters, trims on the sill and Palladian arches on the gable end walls. The sunroom is a plain structure, it may have some decorative accessories like window grids and ridge cresting but the ornamentation is limited. Both sunrooms and conservatories are typically used for entertaining. You will find a dining table in some rooms and sofas in other glass structures. Each space is based on the intended use. If the home owner is artistic they may turn the room into an art studio and if the room will be used for a family there may be allocated space for homework or a game area with a pool table. Many sunrooms use outdoor furniture inside the space, such as a lounger and side chairs. The outside fabric will better withstand constant sun exposure, fading and retain composition longer than regular interior fabrics. It is easy to use plants in these people oriented glass spaces. Table tops may look bare without an arrangement or center piece. This is a great place for rotating plants. As a flower blooms you switch out an old one for the new flower. Furniture display pieces are another viable option for growing plants. You can add a baker’s rack or built in shelving. Here you can show off accessories like plates and candles, along with your flowers. Plant stands placed throughout a room are another easy choice for expanding your growing space. Using a plant stand or large flower pot, instead of an end table, is a common use in glass rooms. Most sunrooms and conservatories have groupings of furniture, and place a large ficus or palm behind a sofa to fill in the dead space of a corner. I am particularly fond of changing the décor of our conservatory each season. It gives the conservatory a new look and creates visual interest. I switch the table cloth, accessories, and throw pillows. In spring and summer I use purple colors, fall is oranges, holiday decorations for December, and then burgundy for the remaining winter months. Just as I switch out the decorations, I switch out the plants. In the summer I have a pink oleander which grows in the conservatory, blooming and looking gorgeous. Then when September arrives and I bring my fall colors into the conservatory, the pink blooms clashes terribly. The oleander is taken out of the conservatory and is replaced by a deep purple begonia. At the same time I have plants which never leave the conservatory. There is a ficus which lives in a corner behind a loveseat style sofa. A cane yucca stays on a plant stand, and a schefflera takes the place of an end table. These plants have green foliage and do not bloom so they work with each season. No matter where you have space for plants, the gardener will fill it. Glass rooms and the residential homes showcase the gardener’s pride and green thumb. There is nothing better than waking up in a snowstorm and looking at your beautiful plants. Starting seeds in spring, whether in the kitchen or greenhouse, creates a yearning for warm weather when you can play in the dirt. Plants function as great accessories for all spaces and provide the gardener with even more amounts of growing. Lyndsey Roth is a Garden & Greenhouse contributing editor and experienced greenhouse grower. Photo compliments of Solar Innovations.